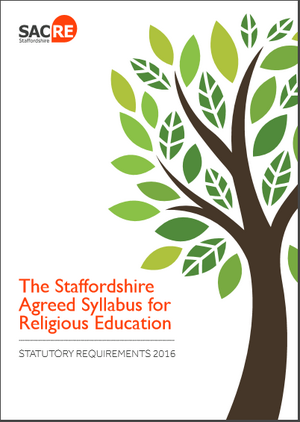 Staffordshire SACRE created its new Agreed Syllabus for Religious Education ready for use in schools from September 2016. The Syllabus affirmed that the role of RE is to foster in each pupil a growing level of religious literacy, through three complementary aims, encapsulated as Exploring, Engaging, Reflecting. The first two of these correspond to the standard themes of “Learning about” and “Learning from” religion. The third aim called for pupils to “acquire a growing range of the social, spiritual and emotional skills and dispositions appropriate to living well in a religiously plural and open society, by reflecting on the reality of religious diversity and on the issues raised by living in a diverse world”. While this aspiration relates realistically to the demographic situation in the country as a whole, the population in Staffordshire is markedly less diverse than that of neighbouring authorities, of the region, and of England, both in religious variety and in numerical presence. Ethnicity figures from the 2011 Census revealed and presented certain challenges for teachers as they worked to bring the third aim “to life” in the classroom, and so enable their pupils to have the opportunity and experience of engaging in and reflecting on religious diversity. Staffordshire SACRE was particularly mindful of these statistics during the creation of its new Agreed Syllabus for Religious Education. There was a deliberate intention to ensure that despite the limited diversity in the county, Staffordshire’s pupils would be both required and supported to understand more fully and reflect on the religious diversity of our nation. This was the background to our project and Staffordshire SACRE now seeks to support and empower schools to fulfil the requirements of the third aim through the creation of a face to faith experience entitled ‘Explore, Engage, Reflect’. In seeking to draw pupils out of their comfort zones into engaging with the reality of diversity, we are confident that the new Staffordshire Agreed Syllabus will help to shape future generations.